Persistence Market Research (PMR) has lately published a new market research report on pediatric hearing aids. The report provides useful insights on the sequential growth trajectory of the market along with the current and future growth prospects present in the market. The report delivers an exclusive understanding of the global market stressing on the regional and segment based aspects prominently. Historically, North America reigned the pediatric hearing aids market trailed closely by Europe. However, increasing awareness among parents towards child’s hearing aids in developing regions such as Asia Pacific and the Middle East and Africa is exhibiting a noticeable growth in the pediatric hearing aids market. Thus, China, Brazil, India, and Dubai are expected to present potential growth opportunities for the market to flourish in the coming years. The average per capita disposable income of Asia Pacific grew by over 19% in real terms, while per capita annual disposable income grew almost by 64% between 2007 and 2012. 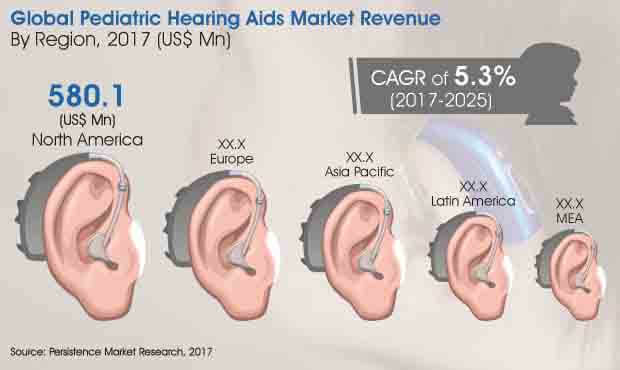 Owing to the high penetration of leading market players, mostly in the U.S., North America emerged as a mature market in terms of pediatric hearing aids. Medicare and Medicaid Services have a proposed reimbursement scenario for hearing loss which will upsurge the demand for hearing aids usage in North America in the coming years. The U.S. holds a major share among all countries in North America due to the growing awareness about pediatric hearing aids as well as favorable reimbursement policies. The Gross Domestic Product (GDP) of a country significantly contributes to the health care expenditure. The GDP of various countries is gradually increasing every year. As a result, health care allocations have increased, which in turn is driving the growth of the global hearing aids market. In 2014, for instance, the U.S health care expenditure increased to 5.3% from 2.9% in 2013, accounting for US$ 3.0 trillion. Medicare expenditure grew to 5.5% from 3.0% in 2013, accounting for US$ 618.7 billion in 2014. Several research activities are being undertaken by organizations for finding the cure for deafness among pediatrics employing stem cell technology. If the research turns out to be successful, it would have a tremendous impact on the global hearing aids as well as pediatric hearing aids market, owing to possibilities of hearing impaired people regaining their ability to hear. Rising research and development of novel and advanced products is likely to bode well for the market in the course of the forecast period. At present, Germany dominates the pediatric hearing aids market which is then followed by the U.K. owing to the high adoption rate of technologically advanced pediatric hearing aids. The leading manufacturers are focusing on technological advancements in order to strengthen their product offerings to boost their market position in the region. Leading market players in Europe for pediatric hearing aids are introducing innovative and expanded product line in order to retain their market share. Companies are increasing their research and development expenditure in order to develop innovative products. These novel products offer additional advantages than conventional hearing aids. Digital hearing aids enable connectivity to television, mobile phone, iPod and other electronic devices. Moreover, hearing impaired patients are inclined towards innovative features; hence, research and development is a factor that is expected to drive the overall growth of the pediatric hearing aids market in the long run. However, limited reimbursement policies available for patients with impaired hearing in the region by several governments might act as a roadblock in the growth of the market in Europe in the coming years.